Specimen collection numbers SCL 15265 and SCL 15372 in the UBC Herbarium Algae Database. Search the collection numbers in the database for more information on these specimens, or search the species for further occurrences. Images courtesy of Sandra Lindstrom. 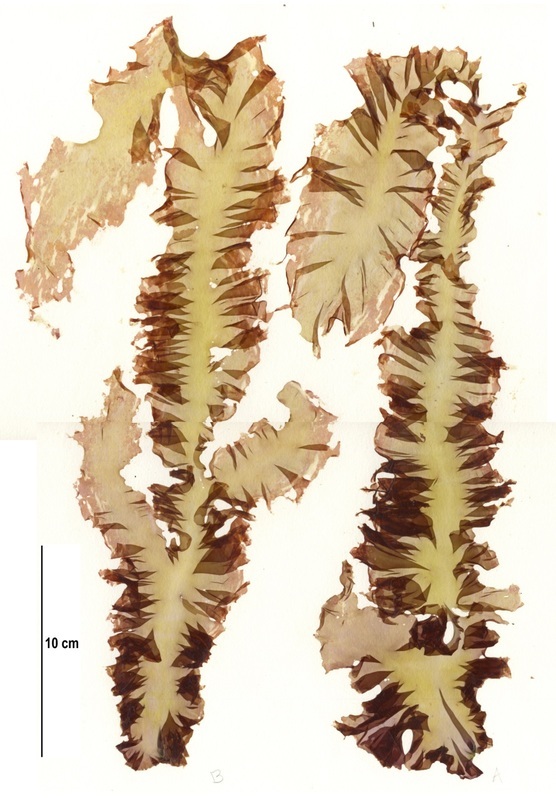 The thallus of this red seaweed can be up to 50 cm long and 5 cm wide. 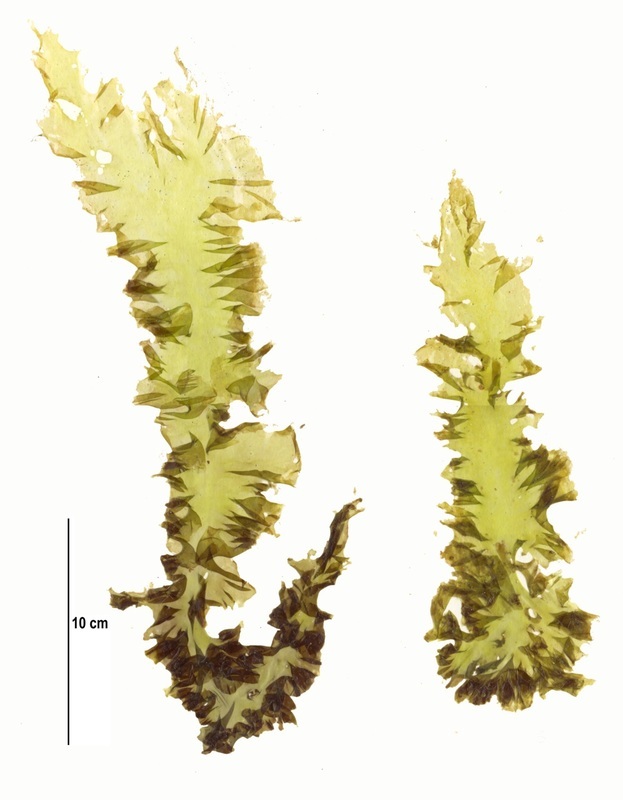 Black seaweed actually has a green thallus that is one cell layer thick with distinctly ruffled blade margins. Female cells, located on blade margins, become bright red after they are fertilized. This common and often dominant species can be found on exposed to semi-exposed rocky shorelines in the low and mid intertidal zone. Its range extends from Alaska to northern California. The individuals pictured here were collected from Boulder Beach and 4th Beach on Calvert Island, near the Hakai Institute. False laver (Pyropia fallax) is quite similar in appearance, but is differentiated by its paler red margins (female reproductive cells). False laver can also be found higher in the intertidal zone, from the high to lower mid intertidal zone, whereas P. abbottiae is more common in the mid to low intertidal zone. ​This species is considered one of the more delicious members of the Pyropia genus. It has traditionally been, and continues to be, an important food source for many Coastal First Nations People. This species is typically harvested in spring and early summer, dried and subsequently processed. It is highly nutritious, and can be served toasted as a snack, combined with other seafood, or used as a condiment. ​Lindberg, M. and Lindstrom, S. (2010). Porphyra abbottiae. Seaweeds of Alaska. Accessed 2016-04-05. O'Clair, R. and Lindstrom, S. Porphyra abbottiae V. Krishnamurthy. In Klinkenberg, Brian. (Ed.). E-Flora BC: Electronic Atlas of the Plants of British Columbia. Lab for Advanced Spatial Analysis, Department of Geography, University of British Columbia, Vancouver. Accessed 2016-04-05.